There is no question that US Secretary Betsy DeVos is an active enemy of public schools. At the right-wing conference she attended last week, she opened with a hilarious commentary ridiculing public school students who are too poor to buy lunch. She proudly told the crowd that she told Bernie Sanders there was no such thing as a free lunch. That's news to most students in my Title One school, which relies on the federal government to give them lunch every day. Maybe DeVos is feeling jolly because her BFFs in the House are moving to take away lunch from poor kids who come to school hungry. Or maybe she finds the free lunch thing amusing because she herself was born rich and married richer. Clearly my students (and I) showed a lack of vision by failing to do that. I don't suppose there were many free lunches in the elite private educational institutions DeVos and her children attended. When your family can pay tens of thousands of dollars annually for you to be away from the riff raff, you don't mix with the sort of people who fall into that category. That, of course, is one reason a whole lot of private schools exist. The problem, in fact, is exactly the opposite of what DeVos says it is. She'd tell you that we need more choice. She'd tell you that we need charter schools and vouchers. She'd tell you that HBCUs are about school choice rather than utter lack of it. She'd tell you that we're condemning our children to inadequate facilities by sending them to the public schools that she and Donald Trump have deemed unfit for their children. 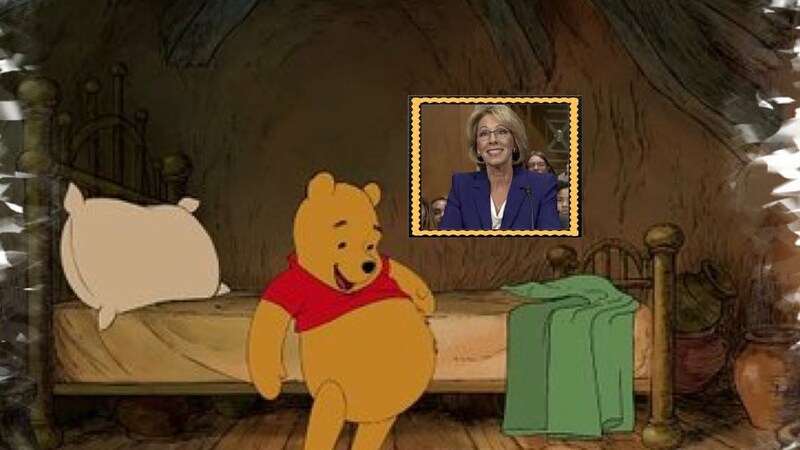 Ironically, under absolutely no scenario they put forth will our children, whether or not they get free lunch, be attending school alongside the DeVos and Trump children. If so-called school choice is not the problem, what is? I'd argue it's Betsy DeVos and Donald Trump. I'd argue it's Michelle Rhee and Michael Bloomberg. I'd argue it's Andrew Cuomo, Joel Klein, Bill Gates, John King, and absolutely every one of the so-called education reformers who decline to send their own children to the schools over which they preside. And yes, I'd have to include Barack Obama in that crowd as well. While I understand taking special precautions for the children of a US President, I have no idea how he rationalizes pushing one system for our children, and opting his into a school that does almost the polar opposite. If Betsy DeVos had been required to place her own children in public schools, can you imagine Detroit, in her home state, facing crumbling, rat-infested buildings as a matter of course? Do you suppose she'd allow such conditions to even exist if they could affect her own kids? In fact Betsy's privatization efforts have led to the deterioration of public schools all over her state. Sadly she's not alone. People with a lot of money give it to folks like Andrew Cuomo, who pushes thinly-veiled voucher schemes much like DeVos does. It's Cuomo who advocated and enabled the junk-science based evaluation system that's brought teacher morale to the lowest I've ever seen it. It's Andrew Cuomo who criticized the system he championed as "baloney" because not enough unionized working teachers were fired as a result. Of course Andrew Cuomo didn't send his kids to public school either, so why does he give a damn what happens to them? Anyone who'd presume to lead a public school system ought to have a stake in it. If Michael Bloomberg and Joel Klein had to send their kids to public schools, would our children be sitting around in crumbling trailers? Would they and their teachers be rated via tests of quality that can be described, charitably, as dubious? Would they set up junk science systems to demoralize and fire the people whose jobs entailed helping their children? Of course not. There ought not to be a multi-tiered education system, and Finland, generally regarded as the world's best, hasn't got one. Education is supposed to be the great equalizer, and as long as we allow it to be controlled by hypocritical windbags with no stake in it, we're not going to reach that ideal. And as long as we entrust our children to people who find our children's poverty a source of hilarity, we're going to move farther from that goal, at a rapid pace. We need to find leaders willing to put their money where their mouths are, and to do that they're going to have to put their children where our schools are.